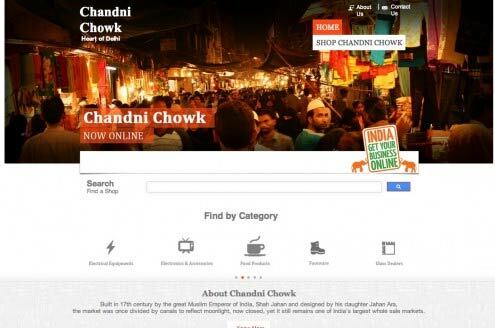 As part of its India Get Your Business Online initiative, Google India claims to have created 2,500 websites for businesses in Delhi’s Chandni Chowk marketplace, and has also set-up a dedicating directory listing page for them at Chandnichowknowonline.in, reports The Hindu BusinessLine. Google is offering business owners a domain name, website creation and hosting, free of charge for one year, together with its hosting partner, HostGator. Interestingly, the sites will also be integrated with Google maps, listing these businesses under various categories on them. The two companies plan to achieve a target of building 5,000 websites for shops in the Chandni Chowk area. After a period of one year, Google India would charge around Rs 700 annually for each site. The main listing page offers a big search bar for finding shops, and various categories for browsing shop listings. The listings also feature the business owner’s name, shop address, and contact number, in addition to the link to its website. The websites are rather basic, much like microsites offered by business directory companies like Indiamart, JustDial and Getit, offering a brief description and a contact information page complete with location info on Google maps. Note that this is not the first time, that a market has been taken online. Delhi’s Nehru Place, the popular computer hardware and IT products marketplace, is online at npithub.com, where users can browse directory listings for shops in the market across business names, products that they offer and brands. But the site is cluttered and it’s cumbersome to browse through it. A directory search service from Google wouldn’t be a bad idea – shops that can be sorted by market or locality. The challenge with taking small businesses online and shops, is to ensure that businesses continue to renew their domain and hosting contracts even after the free period, and that’s when Google will start to reap the benefits of such mass initiatives. For businesses that are focused on exports, it does make sense to go online, but for others, we’re not sure if they need something beyond a directory listing or at the maximum, a micro-site showcasing their business. Also, we feel that Google might make b2c, and to a small extent, b2b online directory listings irrelevant. Frankly, for google this is an attempt to bring more and more SMBs online, with the objective of eventually getting them to advertise on Adwords. Chandni Chowk online might be just PR, but it’s a bigger part of Google India’s sales focused approach under Rajan Anandan. Interestingly, Google is inking tie-ups with directory listings businesses like Getit for marketing its Adwords advertising program to SMBs. Google India had earlier launched an initiative called ‘Lets Talk Mo‘ to let businesses create a mobile site for free or test the user friendliness of their existing mobile site. Google had announced the ‘India Get Your Business Online‘ initiative, last year. Google intends to build 500,000 websites for Small and Medium businesses by 2014 together with HostGator through its nationwide initiative. It claims to have enabled 150,000 businesses with Web presence across 7,850 cities in India in a span of 13 months. Businesses like IndiaMart also focus on bringing SMBs online.